It’s delicious, but also Mindful of those with severe nut allergies. It never fails, every time I find a snack or party mix it typically contains nut ingredients. As much as I love nuts, due to mine and my families allergies we can no longer enjoy them. This snack mix was inspired by a girlfriend who invented her own mix for a Sprinkle (Baby shower) she threw for me. I do not recall the specific ingredients chosen, but ever since that party I’ve been wanting to create a tasty combo myself. What I didn’t see coming was how obsessed I would become with this simple and quick snack mix. I mean typically snack mixes with out nuts just feel like they are missing something, but not this one! Every item in this delectable snack mix was purchased at my local Trader Joe’s; whole grain crunchy and salty multi grain pretzel nuggets, dried organic sweet cranberries and chocolate covered blueberries. Will you dive right in for those yogurt covered pretzels first? 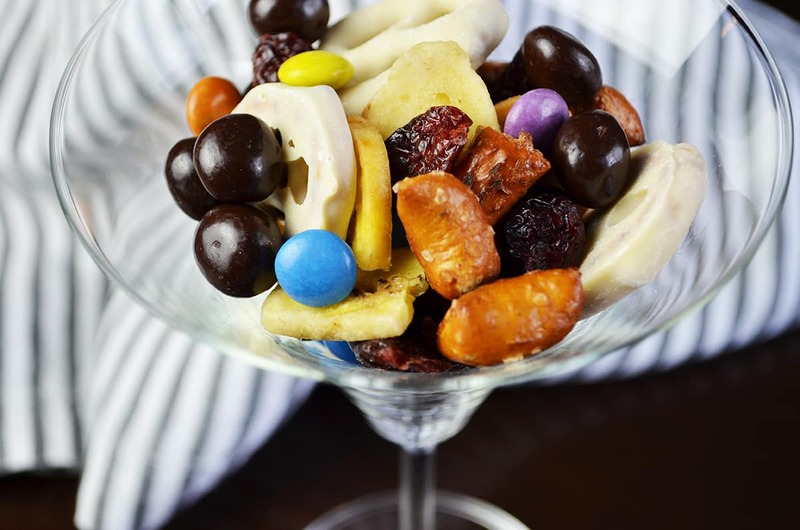 Or maybe the colorful chocolate covered candies that are poured into an adorable martini glass. The banana chips are one of my favorites in there, but then again I love it all, it’s just a perfect combination.